This semester is one of those semesters where I literally cannot believe how fast time is passing. The summer and the start of the semester were extremely busy, but for wonderful reasons. Our merged IT/Library (LITS) overhauled our orientation programming considerably to ‘radically welcome’ new students to Mount Holyoke. A significant part of orientation was also curricular; on the first Saturday of orientation my colleague Leslie Fields and I led the first session of the first year connections course (CUSP). Asked by the organizers to present a session about college history that brought the magic of the archives to about 500 entering students during six concurrent sessions. The question of scale immediately came to mind: how would we think about sharing the wonders of primary sources to so many students during 50 minute sessions? 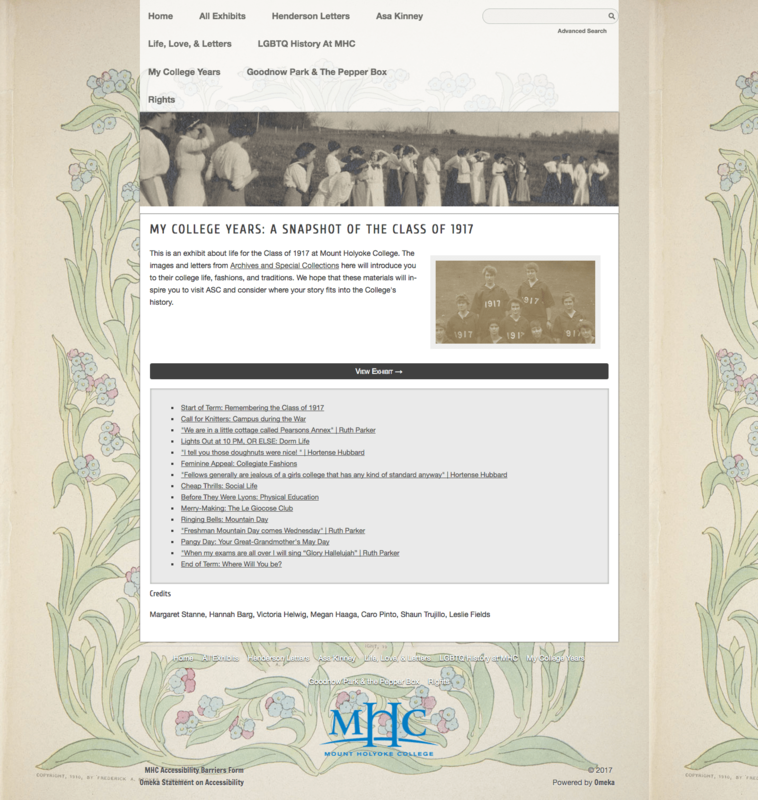 So, how to build a site that would both communicate college history, make curricular connections, engage first year students AND look cool? The four-legged stool of Archives & Special Collections (the goods), RIS (curricular connections), Archives & Special Collections Student Ambassadors (awesome engagement) and Digital Assets & Preservation (technical prowess & keen design sense) decided that we would build an Omeka site collaboratively. DH aficionados love talking about Omeka and there is no shortage of posts talking about its usability and extensibility, but what I wanted to share the link to our site and say some things about the process. –Students Need Context: Over and over again when I work on digital projects with students, just saying, ‘go do this thing!’ never helps. Providing context, instruction, and measurable goals can help students realize their curation potential. I met fairly regularly with our main student to scaffold the process from idea, to research, to storyboarded exhibit towards a proof of concept before we even talked about Omeka itself. –Better Together: Omeka’s extensibility really shines when you work with a variety of stakeholders. I alone in Research & Instructional Support could not have created this successful exhibit without the students’ insight/enthusiasm, special collections’ golden content, or Digital Assets & Preservation’s technical know-how & design moxie. With roles for curation, design, and technical support, we were able to do much more than slap some images onto a site. We created a narrative that leveraged plugins downloaded from GitHub and enjoyed a custom designed inspired from our own archival collections. –Digital Project Outreach Matters: This site was an important step for our team not only in terms of delivering content for a particular class, but also get ourselves better acquainted with a tool that we hope to use more broadly in the curriculum. It’s so easy for successful projects and processes to get lost in the shuffle which is why Sheila Brennan’s post about Digital Project Outreach continues to ring true for me. She writes that “outreach is intentional, is integral to a tools/project’s success…is not only about publicity, the job includes testing and making the tool accessible to targeted audiences; is user advocacy.” We kept our users at the center of this project, not only in terms of the content, but the process, how can we make digital curation scalable to the undergraduate classroom? How can this project be used as model for future projects? We shared our success on social media and found that our community responded with sustained engagement with the site beyond the concurrent sessions during orientation. I also hope that students will also see themselves in the process of creation; that knowing other undergraduates were at the heart of curation will inspire them to ask bold questions and dive into digital scholarship. You can visit our exhibit here.